What is the DOMINO Project about? The DOMINO Project is working towards a model and capacity building for the Implementation of the principles “learning through working” in Bulgarian vocational education. The project aims at the modernization of Bulgarian vocational education, as to enable it to meet the contemporary needs and requirements of business and economy. The project is implemented jointly with the Ministry of Education and Science with the support of the Ministry of Labour and Social Policy and the Ministry of Economy from 2015 to 2019 under the Bulgarian-Swiss Cooperation Programme. The project budget amount 3, 500, 000 Swiss francs, of which 3, 000, 500 Swiss francs (85%) is the co-financing from the Confederation of Switzerland. Project partners are Swiss Federal Institute for Vocational Еducation and Training (SFIVET) and Bulgarian-Swiss Chamber of Commerce (BSCC). The official title of the project is “Swiss support for the introduction of dual-track principles in the Bulgarian vocational education system”. As of the very beginning of the project we started calling it DOMINO, the Bulgarian abbreviation of Dual education for the contemporary requirements and needs of the society. The brief title of the project has been invented by Stanislav Boshnakov, teacher from the coastal town of Burgas. It was selected within 150 proposals in an open public contest, organized in 2015. What are the vocational schools in the DOMINO Project? Vocational School “Ivan Hadzhienov” – Kazanlak, where students of two classes – 9th and 11th grade – started dual education in the professional occupation Machine technician – CNC machines with companies-partners Arsenal JSC, M+S Hydraulic, Guala Closures Tools and UMT Bulgaria.Vocational School for Food Industry “Prog. G. Pavlov” – Sofia, where students of two classes – 9th and 10th grade – started dual education in the professional occupation Technician-technologist in the food industry – specialty “Production and processing of milk and dairy products” with companies-partners Cremio Ltd and Schreiber Foods Bulgaria Ltd. Vocational School in Mechano-electrotechnics “N. Y. Vaptsarov”- Sofia. Students of one class are having dual education for Electrotechnician – Specialty „Electrical equipment of production” with companies-partners CEZ Distribution Bulgaria, NESTLE Bulgaria, FESTO Production Jsc, Alphalift Ltd, LEM Bulgaria and Reichle & De-Massari Bulgaria. Vocational School for Mechanoelectrotechnics – Pleven launched dual education with compani partners CEZ Distribution Bulgaria, “AC – DC” OOD and Vaptech OOD. Vocational School for Mechanoelectrotechnics and Electronics – Burgas launched dual education for Electrotechnician – specialty „Electrical equipment of production” with companies-partners Port of Burgas EAD, Damvent, EVN, Saturn-2 Ltd, SPARTAK JSC. Vocational School for Electrotechnics “G.S.Rakovsky” – Stara Zagora introduced dual education in professional occupation Electrotechnician – Specialty „Electrical equipment of production” since school year 2016/2017 with companies-partners Oscar Ruegg Bulgaria, ATE Plast and Maritsa East Mines. Vocational School for Transport and Energy “Henry Ford” – Sofia launched dual education for Mechanics of energy facilities and installations – Specialty “Gas facilities” with companies-partners Overgas Networks JSC, A&A Engineering Ltd, Tobo Gas Ltd, New World Technologies Ltd and Thermoclima 2004 Ltd. Vocational School for Industrial Technologies “ Burov” – Ruse: 9 students are studying for Mechanics of energy facilities and installations – Specialty “Gas facilities” with companies-partners Overgas Networks JSC and Dunarit AD. Vocational Technical School “Ivan Raynov” – Yambol opened dual education classes for Mechanics of energy facilities and installations – Specialty “Gas facilities” in partnership with Overgas Networks JSC. Vocational School for Tourism Prof. Asen Zlatarov” – Burgas provides dual education for the profession – Cook – Specialty „Production of culinary and beverages as of school year 2016/2017 with companies-partners Energy team 2010 Ltd, Kiten Vacation Ltd, Kishishkova 2013 Ltd and Demi-67 Ltd. Vocational School for Tourism “P.K.Yavorov” – Dobrich has dual students in the professional occupation Cook – Specialty „Production of culinary and beverages” in partnership with Albena JSC. Vocational School for Food and Textile Technology “Rayna Knyagina” – Stara Zagora launched dual education for cooks – Specialty „Production of culinary and beverages” with companies-partners Expert 007 Ltd, Zagora City JSC, Sharon-2007 Ltd, Stanislav Nedelchev-Slav Sole Trader, Tensidey Sole Trader, Vimar Ltd, Balty 2012 Sole Trader, Green Hill Ltd, Zarainvest-1 Sole Trader, SB 8 Ltd, Plamen Petrov-P Ltd, and Metalic JSC. Vocational School for Textile and Tourism “St. Ivan Rilski” – Pernik has dual education classes for cooks – Specialty „Production of culinary and beverages” with companies-partners Vintage Rest Ltd, Greenville Bulgaria EOOD, BLVD Ltd, Global Properties Limited (Bulgaria) EOOD, Interhotel Grand Hotel Sofia PLC, Victoria Ring Ltd, Petrov Commerce 98 Ltd and Sofia Hotel Balkan AD. Vocational School in Mechanotechnics – Sliven: 24 students enrolled in dual education classes for Machine technicians – Specialty CNC machines with companies-partners Petrov 2006 Ltd., ZMM Sliven AD and Boral 5M. Vocational School for Mechanotechincs “Prof. Tsvetan Lazarov” – Plovdiv launched dual education for Machine technicians – CNC machines with companies-partners Biomashinostroene AD, ABB Bulgaria EOOD, Schatti Bulgaria EOOD, William Hughes Bulgaria Ltd, Ka enginering Ltd, INDEX-6 Ltd and Mondi Stambolijski EAD. What are the new professional occupations in DOMINO as of school year 2016-2017? What are the new professions planned to be part of DOMINO as of school year а 2017/2018? These new professional occupations have been approved on 16 June 2016 in Sofia at the 4th session of the Forum on Dual Education, which was officially opened by Secretary of State for Economic Affairs of Switzerland Mrs Marie-Gabrielle Ineichen-Fleisch and Bulgarian Minister of Education and Science Meglena Kuneva. What are the professional occupations, which will be included in the DOMONO Project as of school year 2018/2019? Catering expert – Specialty “Catering”. These three professional occupations have been approved by the Forum on Dual Education on 6 March 2017 in Sofia. Opening this 7th session of the Forum, Minister of Education and Science Prof. Nikolay Denkov applauded the DOMINO Project for its approach and described the experience of Switzerland, Germany and Austria as extremely important for the introduction of dual education in Bulgaria. Ambassadors of Switzerland and Germany Denis Knobel and Detlef Lingemann, as well as Thomas Stoelzl, Chargé d’affaires of the Austrian Embassy in Sofia addressed the Forum. What is the procedure for including new professional occupations in the DOMINO Project? The selection of new professions for DOMINO is based upon a set of criteria, of which the most important are: the steady partnership between the vocational schools and companies, the readiness to join the DOMINO Project; serious demand of this profession, its added value to the business sector, etc. Why does Bulgaria go for the Swiss experience in the introduction of dual education, as the country has a long history in vocational education? In the DOMINO Project, we are gaining experience from the best practices in dual education throughout the world, as well as from the good old traditions of Bulgarian vocational training. The current situation, however, is totally different compared to 1989, when the transition started: many private enterprises occurred; the government orders for education stopped, the prestige of vocational education dropped down, while needs for skilled workers have increased. DOMINO does not impose the Swiss model, but through the project it is working towards a Bulgarian model of dual education in a close partnership and co-financing from the Bulgarian Ministry of Education and Science, as well as business, branch organizations and NGOs (See also the question about the Forum on Dual Education). Why Switzerland? Switzerland is one of the Europe and world’s countries the lowest rates of youth unemployment mainly due to its traditions in the dual form of education. Many countries from around the world learn from the Swiss experience. The experience of Switzerland has clearly proven that dual education has three winners: the students who gain a profession, the companies that will have skilled workers and the state because the system ensures its prosperity. In DOMINO, we are interested in the VET System (Vocational Education and Training) of Germany and Austria, which are also considered as very good ones. The Austrian Chamber of Commerce and the German-Bulgarian Chamber of Commerce and Industry are implemented pilot dual education projects in Bulgaria and therefore, the DOMINO Project cooperates with them based on the joint ambition to support Bulgaria in the introduction of a working and sustainable form of dual education. What are the general DOMINO requirements for the schools that will introduce the principle “learning through working”? The major requirement for schools that will be pioneering in the introduction of the Swiss model of dual education is the sustainable partnership with the business. Another important prerequisite condition is the school offer courses, which are in great demand by the business. What is the payment the students will receive? The payment is planned to be a percentage of the minimum wage based on the hours of actual work done. According to the Labor Code of Bulgaria the payment in the dual form of education should be not less than 90% of the minimum wage. How many hours per day and per week shall the students work? In in the 11th and 12th grade, the students will work maximum seven hours a day, three days a week. This makes in total 21 hours per week or 84 hours per month work in a real working environment. Is this in compliance with the requirements of the Bulgarian legislation? Absolutely. The curricula and programmes for the training of the students have been approved by the Minister of Education and Science, as well as their contracts for work in a real working environment and the remuneration are in accordance with Article 230 of the Bulgarian Labour Code. What will be their training program from eighth to twelfth grade? Covering the training from 9th to 12th grade, the Swiss model provides the following distribution: In 9th grade the students will study the basic general subjects. Later on, in the 10th class they will have vocational training one day a week, as these classes will be held at school, if the school has got the appropriate facilities or alternatively, at the company. In this regard, each project partnership will have a specific approach to the capabilities of the participating in DOMINO vocational schools and the partnering companies / firms. The purpose of the practice in the 10th grade is the students to get gradually prepared for the upcoming work environment and specifics of the profession. In the 11th and 12th grades the students will be mainly in the companies, as the project assigns two days in class and three days at work. How long will be the training experience of students? According to the Swiss model of dual training, which is being introduced within the DOMINO Project in coordination with the Ministry of Education and Science, the students of 11th and 12th grades will spend three days in the company and two days at school. Thereby, the students will combine the knowledge acquired in school and the skills gained in real working environment. Are the instructors in the companies already trained? How will be their work organized and scheduled? Within the project, we are regularly training instructors from the companies. According to the Regulation on Training Through Working the companies should provide at least one instructor for 5 students. What is new in the Swiss model? The core feature of the Swiss model of dual training is the approach for developing the curricula and programmes. The model is not simply based on “learning by working”, it also provides the tool to determine the really needed practical skills of the students, which will enable them to be fully prepared for the labour market. This methodology which ensures that the studying process meets the needs of the business as much as possible. This model is based on qualification profiles, which are being developed jointly by workers with certain professional experience, teachers in theory and practice of the chosen professions and last but not least, experts from the Ministry of Education and Science and the National Agency for Vocational Education and Training (NAVET). These qualification profiles serve as the basis for the curricula and the training content in the respective specialties, as well as to ensure the business participation in their defining. Another important feature of the Swiss model is the opportunity for the students in the last two years of their study to work in the designated companies with a labour contract and relevant remuneration. What are the challenges dual education in Bulgaria is facing to? The big challenges for dual education remain the lack of trust between business and schools, the concerns of parents, students and teachers, as well as the lack of understanding of the dual system. What is the assessment of the DOMINO Project so far? DOMINO enjoys interest of several countries from around the world. The project received a worldwide recognition at the International Congress on Vocational and Professional Education and Training in Winterthur, Switzerland in June 2016. The DOMINO Project was considered named by Swiss officials and experts as one of the most successful collaborative projects based on Swiss experience in dual education. Attended by over 450 delegates from 80 countries, the forum discussed the role of vocational education as the key to economic growth and low unemployment. The Bulgarian project raised significant interest among countries that are considering or are already in the early stage of introduction of the dual form of education. Over 150 participants in the congress from Canada, South Africa, South Korea, France, Hong Kong, Singapore, India, Mexico, Georgia, Serbia, Kosovo, Romania and others came to attend the DOMINO presentation. In March 2017, DOMINO was presented at two forums in Switzerland as a good example of a project, financed by the Swiss contribution to the enlarged EU – the Bulgarian-Swiss business forum in Lenzburg, which was attended by over 80 business representatives from both countries, as well as the business meeting in Bern, organized by the Bulgarian Embassy in Switzerland. Съгласно планираните дейности по Проект „Швейцарска подкрепа за въвеждане на принципите на дуалното обучение в българската образователна система” (проект ДОМИНО),като спомагателен орган към екипа по управление на проекта е предвидено създаването на Форум за дуалното образование. Форумът обсъжда проблемите в професионалното образование. В неговите заседания се включват над 100 участници – представители на всички държавни институции, частни фирми, браншови и бизнес организации, местни институции и неправителствения сектор, както и представители на медиите. Целта на Форума ще бъде не само да се обсъждат проблемите в професионалното образование в България, но и да се правят конкретни препоръки към Народното събрание, Министерството на образованието и науката, Министерството на труда и социалната политика и Националната агенция за професионално образование и обучение за решаването на тези проблеми. Форумът ще бъде организиран и администриран от Българо-швейцарската търговска камара и ще функционира в период от две години. Първото заседание на Форума се проведе на 16 септември 2015 г. и беше открит от швейцарския държавен секретар за образованието, научните изследвания и иновациите Мауро ДелАмброджо и министърът на образованието и науката Тодор Танев. What the role of Forum on Dual Education? Set up as a subsidiary body to the DOMINO management unit, the Forum on dual education discuss the main topics of vocational education and the introduction of dual education in Bulgaria. Over 100 participants – representatives of all government institutions, private companies, professional and business organizations, local institutions and NGOs, as well as media representatives – take part in its regular sessions. The Forum does not just discuss topics of the vocational education in Bulgaria, but also to propose specific recommendations and solutions to the National Assembly, the Ministry of Education and Science, the Ministry of Labour and Social Policy and the National Agency for Vocational Education and Training. 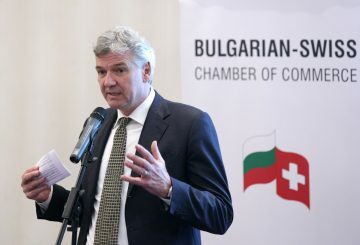 Organized and administered by the Bulgarian-Swiss Chamber of Commerce, the Forum will be operating within a period of two years. Its first session on 16 September 2015 was officially opened by the Swiss State Secretary for Education, Research and Innovation Mauro Dell’Ambrogio and the Bulgarian Minister of Education and Science at that time, Prof. Todor Tanev. Where can we find more about the DOMINO Project?